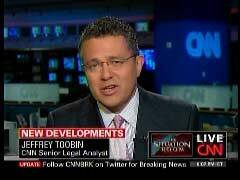 On Sunday's Newsroom, CNN senior legal analyst Jeffrey Toobin disputed the conclusion of the Los Angeles Times on the apparently shocking new political initiative of Clarence Thomas's wife Virginia Thomas, that it "could give rise to conflicts of interest for her husband...as it tests the norms for judicial spouses." Toobin defended Mrs. Thomas' grassroots conservative work. Anchor Don Lemon brought on the senior legal analyst just before the bottom of the 10 pm Eastern hour to discuss Kathleen Hennessey's article in the Sunday L.A. Times, titled "Justice's wife launches 'tea party' group." The Times writer indicated that Mrs. Thomas' new organization somehow risked the partiality of the Court, as indicated in the article’s subtitle, "The nonprofit run by Virginia Thomas, wife of Supreme Court Justice Clarence Thomas, is likely to test notions of political impartiality for the court." She continued later that "the move by Virginia Thomas, 52, into the front lines of politics stands in marked contrast to the rarefied culture of the nation's highest court, which normally prizes the appearance of nonpartisanship and a distance from the fisticuffs of the politics of the day." Hennessey also cited "expert on legal ethics" Stephen Gillers of NYU, who advised Justice Thomas to "be on alert for possible conflicts, particularly those involving donors to his wife's nonprofit. 'There is opportunity for mischief if a company with a case before the court, or which it wants the court to accept, makes a substantial contribution to Liberty Central in the interim.'" Toobin, who over two years earlier accused Justice Thomas of displaying "a distinct solicitude ... for employers over employees, for government over individuals, for corporations over regulators, and for executioners over the condemned" in his term on the Supreme Court, actually brushed aside such concerns, citing Mrs. Thomas' long involvement in politics. He only raised the issue of "whether it's good judgment, and whether it's a appropriate thing to do." LEMON: So listen, is there anything ethically wrong with a Supreme Court justice's wife getting involved in politics? TOOBIN (by phone): Well, there's certainly nothing illegal, and there's nothing in the canons of ethics that prohibits what Ginni Thomas is doing. There is, perhaps, the question of whether it's good judgment, and whether it's a appropriate thing to do. But certainly, there's no rule that either she or her husband is violating. LEMON: Okay. So listen, here's what- you think of some of the words. She says, 'I am an ordinary citizen from Omaha, Nebraska, who just may have the chance to preserve liberty, along with you and other people here,' and this is what she said to tea party leaders in Washington. And then she went on to say- count herself 'among those energized in action by President Obama's hard left agenda.' First, as we said in the beginning of the show, it was the President criticizing U.S. Supreme Court justices at the State of the Union, and then, now it is her criticizing him. So these words, again, are they going to come back possibly to haunt Clarence Thomas in any way? LEMON: And you know what, you're right, because, I mean, she fired right back and made a point- you know, noting to the L.A. Times that Pennsylvania Governor Ed Rendell is married to a federal appellate judge- so saying, what's the difference? LEMON: You know what, we've- I'm going to move on here, Jeffrey, but- you know, freedom of speech- that's what this country is about, and her husband's a Supreme Court justice and you're an attorney, so- you know, everyone has that right. But, as you said, it may not be prudent for her to do that. TOOBIN: Prudent- that's the word. Jack Dunphy, writing on Patterico's Pontifications blog, accused the L.A. Times of holding a double standard on the spouses of judges. Dunphy noted that Ramona Ripston, the wife of Judge Stephen Reinhardt of the infamous Ninth Circuit Court of Appeals, has been the "longtime head of the Southern California chapter of the American Civil Liberties Union," and yet, "the potential for conflict of interest went unremarked upon" by the newspaper.